Five Minute Profit Sites, an online automated software, claims that it can build you a profitable ad revenue generating a website in 17 clicks, and less than 5 minutes. This new ad website will generate $519 a day through a $12.3 million online loophole. This is the business of Five Minute Profit Sites. Who Is The Founder Of Five Minute Profit Sites? What Is The Cost To Join Five Minute Profit Sites? Is Five Minute Profit Sites A Good Investment? Five Minute Profit Sites is proprietary web-based software that allows members to choose a predesigned, ‘do it for you’, a website which will generate money through affiliate links. The program claims that members can earn more than $500 per day with about 23 minutes of works. No experience is required when creating the five minute profit sites. It just takes about 5 minutes and 17 clicks to create a highly profitable website, everyone can do this. The owner claims to discover a $12.3 million untapped loophole which he will share with all members to help them generate millions online while at sleep. Making money online through affiliate marketing is true, but not with a 5 minutes website. These promises are too good to be true, especially for a Clickbank product. Five Minute Profit Sites sound like a scam product. No one knows the real owner of Five Minute Profit Sites. It is another mystery. All paying members are introduced to a lady who claims to be, Sam Smith, the creator of Five Minute Profit Sites. We believe Sam Smith is a fake character, not the true owner. It seems like the owner of Five Minute Sites does not want people to know who he or she is, so he/she created this fake character. Members will also meet a trainer name Chris from the training videos. Chris may be the owner of this product since he is doing the training. Sam Smith and Chris are the same. You will meet them when you become a member of the Five Minute Profit Sites. There are a few steps that all members have to take once they enter the members’ only area. The first few videos will teach you how to use Five Minute Profit software and how to generate your own website. Connect your Clickbank ID with your five minute profit sites. If you don’t have a Clickbank account, sign up for one. Register with AWeber, then link your AWeber account with your five minute profit sites. There are some more training videos on basic email marketing and Clickbank products teaching the basic steps of affiliate marketing. The five minute profit sites process is simple and quick. It is true that you have a website in five minutes, but I don’t believe you can make $500+ per day with this website. I will explain below. The initial cost to create an account with Five Minute Profit Sites is $37. However, there is an offer for a free seven days trial, after which you’ll pay $7 per month. If you are interested in testing out the Five Minute Profit Sites, I recommend using the 7 days free trial. Click here. Like other Clickbank products, Five Minute Profits Sites have three more upsells before you can use the program. Faster Profits Upsell – The price tag for this upsell is $147 including a $50 discount. If you don’t have the discount, the actual price is $197. This package offers one-on-one support, free hosting, free domain name, and a faster profit website with more unique articles and product reviews. It also has more Clickbank affiliate links compared to the $37 website. Double Your Profits Upsell – This second package price at $187. With this option, you are allowed to get to choose a niche website outside the make money online niche which you are forced to select at the basic level. However, you are still required to select a niche from a list, not your own niche. Traffic Tsunami Upsell – This product will cost you $97. Traffic Tsunami is a training program showing you a step by step to generate targeted traffic to your website, Tsunami traffic. The total cost to join Five Minute Profit Sites is $518 ($37+$197+$187+$97). You have to purchase all the upsells if you want to make money online with your new Five Minute Profit Sites. This program is designed this way. Without the added upsells program, your five minute profit sites is useless. I personally believe you will not make any money with the basic account. With the added upsells, you can but not at the level of $500+ per day. As described above, Five Minute Profit Sites members make money through affiliate links both ad links and product links. Therefore, five minute profit sites is an affiliate marketing program. A successful affiliate marketing business requires the followings: a website with affiliate links, an affiliate account, and traffic. All paying members of Five Minute Profit Sites receive a predesigned basic affiliate website upon joining. The basic website is so restricted and limited that no member will be able to make money from it. 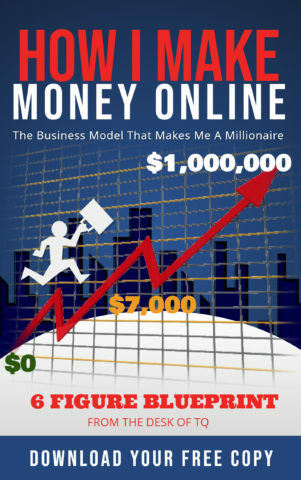 The “make money online” niche is the most competitive online business niche to enter. The creator of five minute profit sites understands this that why he offers the two upsells: Faster Profits and Double Your Profits. Even if you purchase both upsells, you still do not have full control of your affiliate website. With this program, you never own your website. Clickbank is a well-known and popular affiliate marketing network online. It is free to join. The problem with five minute profit sites is that members can only promote Clickbank products. As an affiliate marketer, you should be free to promote a variety of products to increase your chance of earning online. The five minute profit sites lock all members into one affiliate network, Clickbank. Most Clickbank digital products are considered junk. It is very difficult to promote these products and earn a good commission. Because of this, a $500+ earning per day promises by five minute profit sites is unrealistic. To make money, you need traffic. The basic five minute profit sites account does not offer or teach you how to generate traffic to your website. The program does provide you with two options to generate traffic, but both cost money. AWeber is not a free program. Yes, it is free to signup, but to get the code for your website, you have to pay. Your five minute profit sites will not work without the AWeber code. This is a surprise to many new members who do not realize this until their website doesn’t work. If you don’t want to purchase AWeber, you will lose all your investment. Your five minute profit sites is dead. As discussed earlier, this is an upsell which will cost you more money. Traffic Tsunami is a training program teaching you how to generate targeted traffic to your website. Since this is a training program, you will have to learn and do all the works in generating the traffic. You will have to invest more than 23 minutes a day for this to work. I personally think this program should have been part of the basic account because five minute profit sites members need traffic to make money. It is very difficult to make $500+ per day with Five Minute Profits Sites. This program fails to provide members with a complete working affiliate marketing business package. As a basic member, you are paying $37 for an incomplete and a basic website from five minute profit sites. This is designed to force you to purchase the upsell packages. Even if you purchase all the upsell packages, you will not make $500+ a day with 23 minutes at work. All the upsells are training programs, not automated software. Training programs are designed for you to learn and practice the skills of affiliate marketing. You cannot make money by only doing this 23 minutes a day. Five Minute Profit Sites is too good to be true. Invest or not invest, you decide. Let me know your final decision.